Jigsaw puzzles are a great way to spend time together as a family. They are also a great learning tool for children and can be used to teach shapes, words, colors, and geography. 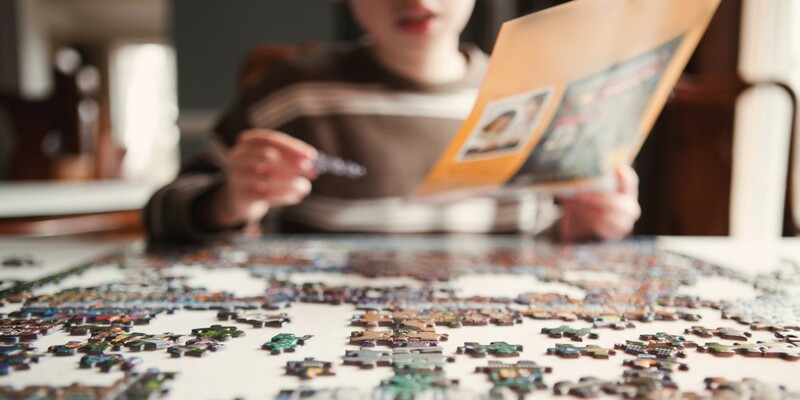 Research conducted by the University of Chicago has found Children who play with jigsaw puzzles between the ages of two and four are proven to later develop advanced spatial skills. These skills are not only important for child development, but aid in the success in science, technology, engineering, and mathematic (STEM) fields. Hand-Eye Coordination – Children develop a correlation between what they see with their eyes and what their hands do when working on a puzzle. Gross Motor Skills – Large piece puzzles can improve use of large muscles of the body in a coordinated and controlled way where they can then move onto work on their fine motor skills. Fine Motor Skills – Smaller, more precise movements like a child using their fingers to flip, rotate, and move puzzle pieces to the correct spot helps strengthen fine motor skills. Development of these skills early on can eventually help with handwriting, drawing, and typing skills. Understanding Surroundings – The ability to manipulate the puzzle pieces and recognize objects helps children gain understanding of the world around them. Problem Solving – Successfully completing a puzzle can be a challenge. When a puzzle is started, there are steps to be taken and critical thinking to complete the puzzle. Memory – Recalling shape pieces that fit or don’t fit together helps with memorization skills. Shape Recognition – Remember the puzzles with simple shapes like triangles, squares, and circles? Even as the puzzles become more challenging with complex and unique shapes, shape recognition skills are utilized. Social Skills – Putting together a puzzle can be a social activity. Children can work together to complete a puzzle, helping them understand teamwork and taking turns. Setting Goals – While the goal of a jigsaw puzzle is to complete it, children will need to come up with a series of strategies to go about completing the puzzle, like sorting pieces by colors or edge pieces. Patience – Puzzles are not a quick task and take patience to complete. Ensure the puzzle is age appropriate. It shouldn’t be too easy to complete, but also not so challenging that they become frustrated and give up. Find puzzles with colorful and fun shapes and pictures to keep your child engaged. What does your child like? Find puzzles that appeal to their interests! On more difficult puzzles, work along with them to keep them interested while also spending some quality time with your child. Let them create a puzzle of their own. There are kits at your local craft store that children can draw on and the pieces are pre-cut, or simply cut up a picture or design on paper into shapes that can be pieced together. The benefits of jigsaw puzzles in early childhood development cannot be emphasized enough. They are a fun and educational tool that help children develop physically, mentally, and emotionally. The skills developed will pay off as they grow older and provide lifelong benefits.